Second Saturday is working day not holiday in half day schools 2017 Rc.No.843 Commissioner & Director of School Education proceedings Rc.No.843 /Pig -1/ 2016 Dated:07.04.2017 Second Saturday is working day, not holiday in half day schools 2017. School Education -Implementation of half day schools from 15.03.2017 to 23.04.2017 - function of school as usual on 08.04.2017 (Second Saturday) - Instructions - Issued - Reg. 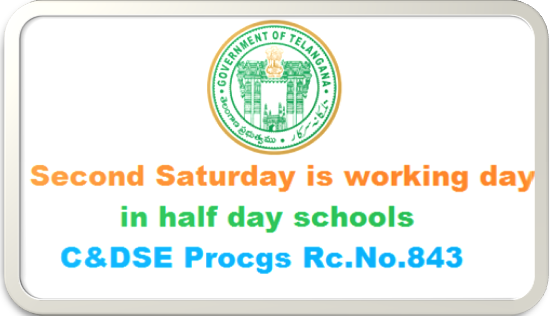 Sub : School Education -Implementation of half day schools from 15.03.2017 to 23.04.2017 - function of school as usual on 08.04.2017 (Second Saturday) - Instructions - Issued - Reg. Ref : This Office Proceeding Re. No.843-Plg-1/2017, Dated: 13.03.2017.